Want to learn how you can arrange a successful social media contest that actually drive results? Social media has proven time and time over the immense marketing powers it has for brands. But the truth is that unless you’re using social media in the right way, you’ll never be able to reach the incredible results you’re seeing everywhere. A screwdriver is a tremendous tool, but if it doesn’t have any batteries, it won’t be very helpful, will it? In other words, it’s all about how you use social media, not that you use it. 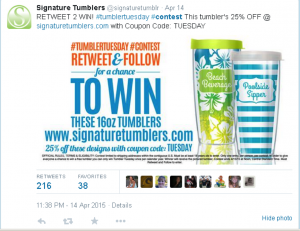 A tactic to drive great results for your business is by setting up social media contests. 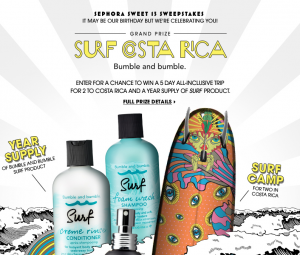 But the thing is that there are a million different ways to set up your social media contest. But there are also a million different ways you can set up your social media contest the wrong way. Anyone can set up a contest and give away a few products, but not everyone can do it successfully in a way that benefits both their audience and themselves. In this article, you’ll learn how to set up social media contests that helps you get closer to your marketing goals on social media – whether it be to skyrocket your sales or to grow your followers. Before we begin, let’s sort something out to make sure there are no misunderstandings. It’s important to know the difference between a giveaway and a contest because there is one distinct difference. For giveaways, you give away something without demanding much from your audience. Only that they enter the contest. But for contests, you expect some kind of counter-performance from the people who are entering. In a contest, whether it be running, or in a game of chess, the best man or woman wins, right? And the same principle goes for when running a social media contest. The winner is picked based on their counter-performance that they contributed with. Not at random. For giveaways, the winner is picked completely by random, because the people who have entered aren’t really contributing with anything, and can therefore not be selected based on their performance or the quality of their submission. As an example, a social media giveaway might be that you give away a shirt with your logo, and in order to have a chance of winning, people have to like your social media post. Then, the winner is chosen by random. For a contest, you might ask your audience to design the most amazing logo for you, and the logo you like the most, and the logo you’re going to start using, and the person who has created that logo wins. In other words, it’s not at random. As you can see, there’s a clear difference between contest and giveaway. For this article though, I’ll stick with the term social media contest, even though I might be referring to both social media giveaways and social media contests. When I use the same term for both, it’s a bit counterintuitive, I know, but for the sake of simplicity, I’ll do so. What’s important is that you know that there is a difference. With that sorted out, let’s look at how you can create social media contests that help you achieve your marketing goals. As with all marketing efforts, it’s important to have goals with your social media contests. If not, you’re just setting up a contest without knowing why you’re doing it, or what you’re hoping to achieve with it. Plus, not having set any goals means that it will be essentially impossible to evaluate whether or not the contest you just ran generated any results. If your answer is ”because I have heard it is good”, try again. Before you do anything else, clearly state the objective of your social media contest, because doing so will allow you to craft your contest in a way that allows you to actually generate results for that metric. All of these objectives demand you to craft your content in a particular way. It’s important to know that the most important part of your contest is the prize. The winning prizes are what drive participants and get them to do something for you, whether it be to like a post or to actually contribute to something. Few people want to do something if they’re not getting (or at least have a chance of getting) anything in return. This also means that the better the prizes, the more contestants you’ll have. If we’re going to do something, we need a reason for it. If I tell you to eat a bee, will you do it? But if I give you a thousand bucks to do it, will you do it then? Most probably would, but definitely not all. But if I then increase that number to a million bucks, the vast majority of people probably would, right? 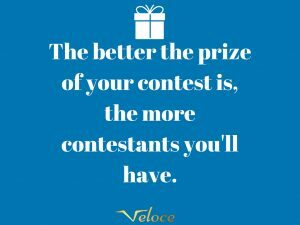 The prize of your contest is the driving motivation for participants, and the better the price, the more contestants you’ll have. Simple. But with that said, it’s easy to believe that if you give away a car or tons of cash, you’ll drive amazing results, and that might be the case – on paper. Because what will happen when you give away high-value prizes that are generic is that you’ll attract a ton of people who couldn’t care less about your business. And if your goal with the contest is to sell more t-shirts to your target audience which is young teens, it will not benefit you a lot if you attract a ton of middle-aged men and women. Because they aren’t within your target audience. But if you give away a generic prize that a lot of people want to have, the vast majority of people who join will be people who are outside of your target audience. This is why the prize you give away is of the greatest importance. Your product should be related to your business because what will happen then is that the vast majority of people who enters your contest will be people from your target audience. If you’re giving away a hockey stick, it is of great value for your target audience – people who are interested in hockey, but the majority of people outside of your target audience don’t have any greater interest in it, right? On paper, giving away a generic prize looks good, because it attracts a ton of people, but when the majority of people couldn’t care less about your brand, they’ll leave as soon as the contest is over. Obviously, the best is to give away a valuable prize that is very specific to your audience, because that is the best way to attract the most amount of relevant people to your contest. But remember that you don’t have to give away a prize that is worth thousands of dollars. Sometimes prizes with a value of just a few dollars can be enough to convince a lot of people. What’s important is that your target audience finds value in it. The most popular prize for brands to give away is their own products. That way, you can build hype around your products, and at the same time not pay a sing dollar to purchase a prize. Now that you’ve chosen the prize to give away for your social media contest, it is time to set up your contest. The first thing you need to decide here is what type of contest you want to run. Coupon offers is a great type of contest to run if your main objective is to increase sales. These types of contests can be how complicated or simple as you’d like, but remember that if you’re giving away coupons, people have to spend their own money – whether it be a lot or little, but getting your audience to take the step of buying from you can sometimes be a bit tricky. In other words, running coupon contests might not always work. For them to have a great effect, your audience needs to really value your products. And the better the coupons, the more people you’ll be able to convince, similar to giving away a regular prize. For instance, if Rolex would run a coupon contest where they give the people who win the coupon 50% off on buying watches, they would attract a ton of people, because people value their products, and most importantly, they’d be able to resell them at a much higher value than they bought it for. This is why coupon contests work for some brands, and not for others. And it is most often based on the value of the product. This is probably the easiest type of contest to run when it comes to entering. A sweepstake means that people join your contest with a simple action, for instance by liking your post, following you on social media, or signing up to your newsletter, and then wait for you to draw the winner(s). Vote contests are actual contests where the winners get selected based on their contribution. The only catch is that you aren’t the one who selects the winner, but instead, you expect your audience to be the judges. Running this sort of social media contests engages your audience and makes them a part of the process, which can help make them more engaged in your brand. But when doing this type of contest, you also have to be a bit careful with how you set it up. For instance, I’ve seen brands on Instagram that have asked their audience to share a post on their social media as a contribution, and then, the post with the most amount of likes wins. And that might sound like a good idea, but the problem is that it is so easy to just by a ton of likes, plus, it’s an unfair advantage for the people who have lots of followers, which will ultimately prevent people from joining as they know they don’t have a chance. This is why, if you’re going to use this type of contest, you need to ensure that it is done under fair conditions. This can be similar to vote contests, but the best way to run photo contests is to be the judge yourself and pick the person with the best contribution. What you need to have in mind, though, is that this type of contest generally has a higher entry barrier, as you ask people to spend time taking a photo and then posting it. This is why you need to give away a prize that is worth spending time and effort for if you’re going with this type of contest. 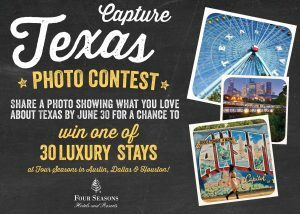 The best part about photo contests is that you get a ton of user-generated content that you can use in your marketing. Especially if the photos being shared are focused on your brand or products. User-generated content has shown to be tremendously effective in marketing because it carries a lot of trusts since it’s not created by the brands, but by your audience. This makes this contest both effective in driving results with your contest, but also for using the content created in your marketing further on. A type of contest you’ve probably seen before is the type of contest where people are asked why they should win, or to write something else, for instance a poem or rhyme. Similar to photo contests, this type of contests has a bit higher entry barrier, as it demands both time and effort from your followers. The best part about this is that you can ask your audience to write something that gives you as a brand value. For instance, it can be to ask your audience to tell you about how they found you, what they love most about your brand, have them come up with your new slogan, or name a new product of yours. Heck, it can even be to ask your audience to tell them what they think is worst about your brand, and then you can use that feedback to improve. This also creates a type of User-generated content (UGC), which means you can leverage it in your marketing. All people have to do is like a post of yours, comment on your post, or follow you in order to join. This means that the entry barrier is very low, which also means that you don’t have to have the most amazing prize in order to convince people to enter. The most important part is that you choose a type of contest that aligns with your objectives of running a contest. If your goal is to increase the number of followers you have, then obviously you should create a contest where the rules of entry is to follow you. If your goal is to collect user-generated content, then obviously you should ask your audience to contribute with something to join. Of course, there are plenty of other ways you can set up your social contests, but these are some of the most common ones that brands use. No matter what type of social media contest you run, visual content should be a part of it. When I say visual content, I mainly mean a visual graphic which announces your contest and gives all necessary information about it. The visual content you create needs to be appealing, attention-grabbing, and clearly give people the information they need to join your contest. Creating a visual piece of content for your contest is super simple with design tools like Canva. When designing your visual, you want to use strong, attention-grabbing colors, as well as use a large font text which clearly shows that you’re running a contest. This will ensure your audience sees it and prevent them from scrolling past, and (if done correctly) make them excited about joining. Be short and straight to the point, and use clear calls to action. Ideally, you should include what the prize is, as well as the duration of the contest, together with your business name so it’s clear who is running it. There are plenty of social media platforms out there, and it’s easy to get carried away and run your contest on every single platform you’re on, but the truth is that it’s usually best if you focus on one social media platform when running your contest. You don’t want to spread your efforts, but instead, put all your focus on one place. You can, of course, cross-promote your contest from your other social media accounts, but when it comes to entering, it should only be possible to do so on one social media platform. Not only does this allow you to better track the entries, it also encourages your followers on your other social platforms to start following you on the social platform you’re running your contest on. When you create a social media contest, it’s important that your rules are clear so that people know everything they need to know about the contest without asking any questions. Having clear contest rules also prevents the risk of any misunderstandings. Not only should your contest rules be clearly visible in the visual in the graphic you share, but you should also present it in text form as well. It’s better to be over explicitly than unclear. What are the conditions for entering? For instance use, a particular hashtag, have an open profile etc. How and where will the winner be announced? It’s easy to believe that the longer your contest is live, the more contestants you’ll be able to accumulate. But in fact, that’s not always the case. Instead, if it is a long time between the time when you announce your contest and when you end it and announce the winner, there’s a great chance that people will forget about it. Plus, the vast majority of people will enter your contest within the first few days, and if a long time passes, your contest announcement will soon disappear among your other posts – unless you’re frequently and actively promoting it. The normal time a contest is live is around one week. You can, of course, let your contest proceed over a longer period of time, as well as have it run for a shorter period of time, but if it’s too long, people might forget about it, and if it’s too short, you’ll miss out on people who haven’t yet had the time to enter. When running a contest, it’s important that you stay on brand. In fact, you should ensure that you stay on brand with all of your marketing efforts. This is why it is popular to give away products produced by the brand in a contest because it ensures the gift is perfectly aligned with the brand, and the focus isn’t ending up somewhere else. This also goes for the visual you’re creating when announcing your contest, and it also goes for your copywriting, and tone. Leveraging urgency is an effective tactic in marketing, so, therefore, it’s an effective tactic when running a contest. People are terrified of missing out, and this is something that you take advantage of when creating a sense of urgency when running your contest. 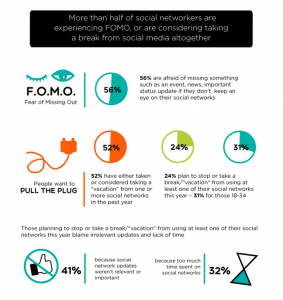 This fear of missing out is often referred to as FOMO, which stands for just that. By creating a sense of urgency, you encourage people to take action quickly. And you convince people to take action quickly because you tell them that if they don’t, the opportunity will be gone forever. One of the most popular ways of leveraging the fear of missing out is by using a countdown clock. Of course, if you’re running your contest solely on social media, this isn’t possible, but if you’re using social media as a tool to promote your contest and have your audience enter your contest through your website, you can incorporate a countdown clock to make it clear that they don’t have all the time in the world to join. If you’re only using social media, you can share post regularly and count down the number of days until it isn’t possible to enter your contest anymore. This is yet another reason to why it is important that you don’t make your contest live for a too long period of time. Because having a time frame that is weeks long will kill any kind of sense of urgency. When your contest has ended, it is time to pick a winner. The way you do that depends on the type of contest you’ve run. If you have run a sweepstake contest, for instance where people have to like your post to enter, you can scroll and scroll and then stop at a name, and there is your winner. Or, if you want to do it more professionally (and if you have the time and patience), you can type in each and every person that has joined your contest in a random number generated, such as random.com. 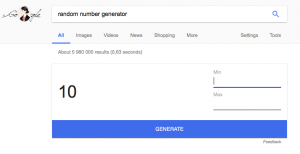 If you give each and every one of the contestants a number, you can just search for ”random number generator” on Google, or click the link (you’re welcome), and you’ll have a random number generator there. When your contest is finally over, it is time to pick the winners. And unfortunately, everyone can’t win, which means a lot of people will be disappointed. At the date when you said that you were going to announce the winner, people will be eager to know if they have one, and if you don’t announce the winner in time, you’ll probably be seeing people who are asking when you will be announcing the winner. This is why communication and doing what you have said you were going to do is tremendously important. In the worst case, if you’re late in announcing the winner, people might accuse you of being a fraud and a scammer. The type of contest you chose should also have told you how you were going to identify the winner. For instance, if you’re running a contribution contest, the way to identify the winner is different from if you’re having a contribution contest where you’re using people’s vote to identify the winner. Therefore, it’s a good idea to have this already thought out of in the beginning, rather than just minutes before it is time to announce the winner. With contests, you want to take into consideration all the legal bits and bobs so you aren’t getting yourself in trouble. When large corporates like Pepsi have contests on social media, they ask everyone to read the terms and conditions so they see what they get into once they enter, and so they can protect themselves from any regal issues. For most smaller brands, though, the only rules shared are the rules themselves of the contest, such as what you have to do to join, what you’ll win etc. In other words, no legal terms and conditions there. Now, I am not bashing down on one or the other, but it can be good to know what you’re getting yourself into before you get into it, so you can protect yourself from any possible legal issues. First off, you need to disclaim and clearly state that the contest isn’t sponsored by the social media platform you’re running it on. If you’re running contests targeted to kids, you also need to ensure that the legal guardian is the one that’s entering. 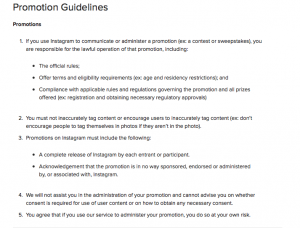 Moreover, it is also recommended that you research the rules for the individual platform you’re using, because these vary, and what you can and can’t do when it comes to social media contests differs a lot. Furthermore, if you’re planning to use your audience’s submitted images or content for your contest, you need to clearly state that you plan on using their content afterward, so the contestants themselves know what they are getting themselves into. When it comes to legal things, it’s always better to be safe than sorry. Social media contests are the most common and popular campaign on social media by brands, and that is because they are effective, and they work. With contests, you engage your audience, and can build a larger one while doing so. But you shouldn’t just create a social media contest without having a clear plan on how you’re going to create a successful one. Anyone can create a social media contest, but not everyone can create a successful one. By following the tips in this post, you’re deemed to succeed right from the word go, and stay clear of any dangers such as legal issues. So go out there and arrange your social media contest today! Let me know in the comment section what you do to create a successful social media contest. I am eager to hear your tips and tricks to a successful contest!